MEP Engineer - Calor Design Group, Ltd.
In-place renovation of 8,500 SF Radiology Department within a 320 bed hospital facility including seven new procedure rooms, patient and staff areas, support space, department offices and a CT Scan facility. All new radiology equipment including technology-intensive angiography and CT Scan equipment. Indirect lighting in corridor and patient holding areas provides soft, low glare illumination for bed/gurney transported patients. 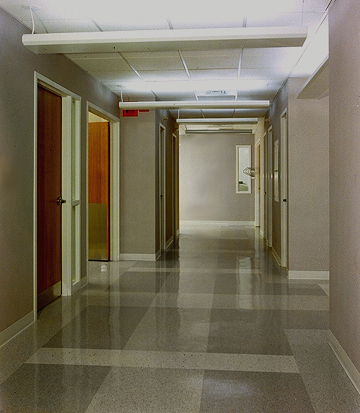 Floor pattern in corridors and diagnostic rooms enlivens spaces. Continuous department operation maintained through 13-month multi-phase project construction.